Complete and flexible document management software solution for Windows users. 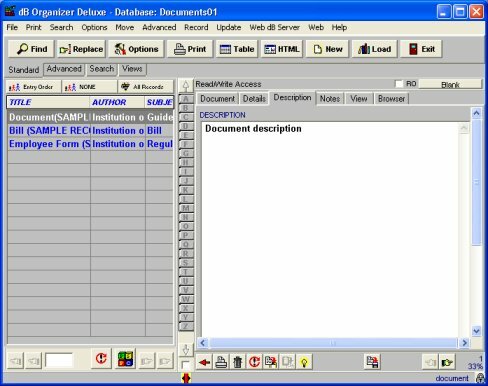 This database software solution gives you an easy way to catalog, organize, and manage information about all your office manuals, research papers, technical literature, government regulations, codes, and more. 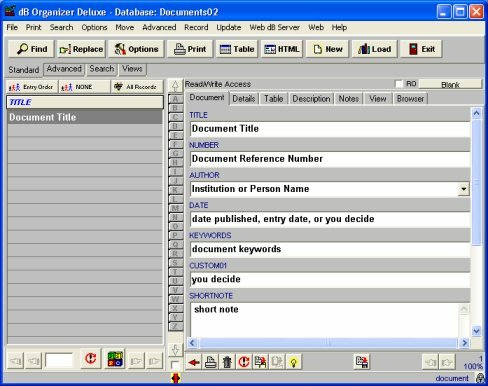 Manage your document information including: document title, number, author, category, document type (bill, book, conference, journal, patent,...), media (article, book, tape, cdrom,..), institution, keywords, document subject, storage place, description, several custom fields, specialized table field, and more. Modify the database template to meet your needs. Create new databases. Find document details quickly with flexible sort, search, or filter. Print document reports, catalogs, or create reference catalogs in html form (web ready). Create customized views to access and display your document records in virtually any way.